Botulinum toxin (popularly known by its trade name, Botox®) is a protein that helps stop muscle spasm. When it is given as small painless injections into the facial muscles it blocks the signal from the nerve to the muscles causing them to relax. This relaxation results in a softening of facial lines. * Crow's feet - the areas around the outside of the eyes. All procedures are carried out by a qualified doctor, Dr Carole McAlister. The treatment takes around 20 minutes. After the treatment the area may be slightly red and swollen, however you can resume normal activities and drive yourself home or return to work immediately after the treatment. It takes 2-3 days before you notice the effects. The full effect of the treatment is achieved by 2 weeks. 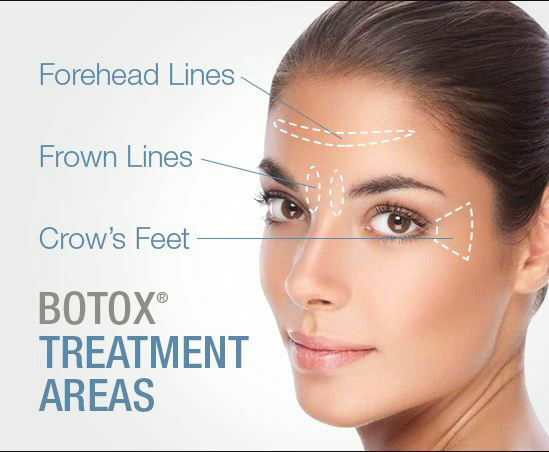 The results typically last for 3-4 months or longer (up to about a year after several repeated treatments of Botox). Side effects of this treatment are rare, but can include some tenderness or bruising at the site of injection. In less than 1% of people treated with wrinkle relaxing injections, it can cause weakness in muscles near to the site of injection resulting in a slight and temporary droop of the eyelid or eyebrow.